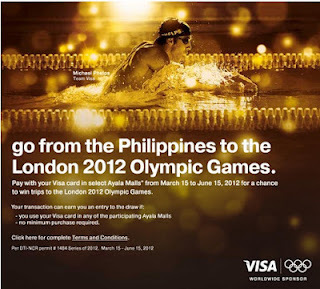 Visa London 2012 Olympic Games ~ Philippine Freebies, Promos, Contests and MORE! Do you want to go to the London 2012 Olympic Games? Then, go non-stop shopping using any of your Visa credit card at any Ayala Malls. Every purchase transaction is equivalent to one (1) raffle ticket. Earn as many tickets as you can for a chance to win the monthly grand prize of London Olympics Package for two (2), a set of His and Hers Omega watches, Panasonic 42" Plasma TV, Samsung Galaxy Tab P1000, Samsung i8150 Phone and Acer A0722-C60. April and June winners will also receive two (2) tickets to the Opening and Closing ceremonies, respectively, valued at USD1,500. Now, that is worth the spend! In case a winner is not eligible or is denied for a UK Visitor Visa, the Olympic package prize will be awarded to the alternate winner.